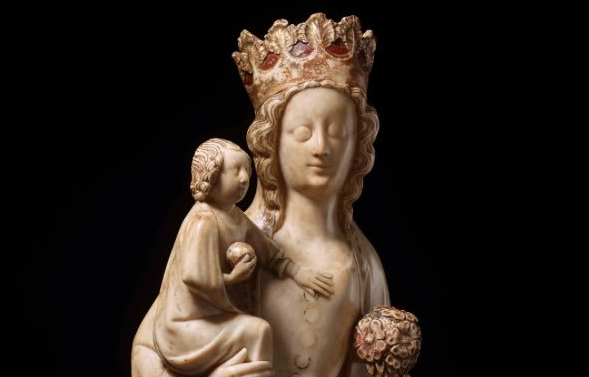 I saw on Medievalists.net on Tumblr the following report of the acquisition by the British Museum of an Engliah alabaster statue of circa 1350 of the Virgin and Child and am reproducing it below, with some additional images. 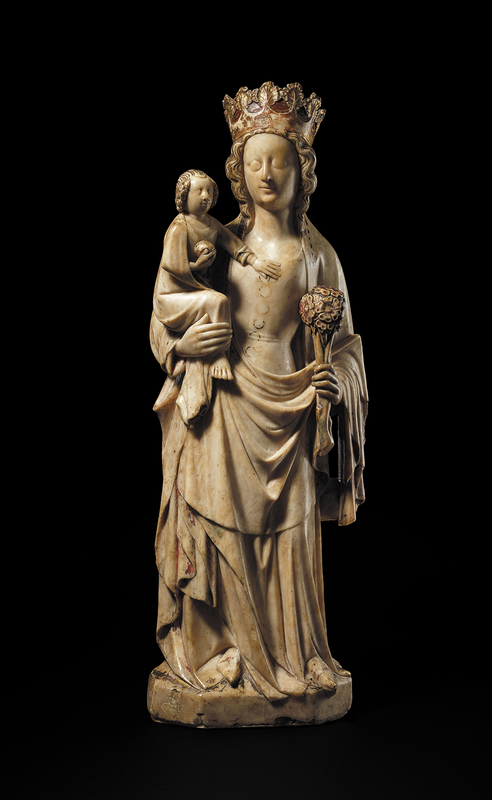 The British Museum has acquired an outstanding fourteenth-century English alabaster figure of the Virgin and Child which is the best-preserved of its kind on display in a UK national collection. The sculpture probably originates from the Midlands and provides a precious insight into carved alabaster from the period that was otherwise largely destroyed, hidden or sold abroad during the English Reformation. The fourteenth-century artists who worked alabaster of this quality attracted the attention of King Edward III, who ordered a carved alabaster altarpiece from Peter the Maceon of Nottingham in the late 1360s. The altarpiece he commissioned for the chapel of St George at Windsor, along with the totality of comparable pieces in situ, were destroyed, buried or sold abroad during the English Reformation. This statue of the Virgin and Child is a rare survivor that escaped this wave of destruction triggered by Protestantism, having perhaps been exported to the continent at the time of its manufacture, or sold off when imagery of this sort was no longer allowed. The unknown British sculptor demonstrates great skill in suggesting both the divinity of the Virgin and her role as loving mother. The viewer is encouraged to identify with the tender relationship between the mother and her son. This interactive object has been touched and kissed by the faithful with the face of the Virgin and the foot of Christ worn through adoration. The standing Virgin is crowned as Queen of Heaven. The Christ Child is seated on her right arm and holds an orb in his right hand and, with his other hand, touches the Virgin’s chest. The sculpture is in remarkable condition and is extraordinary in having suffered no major breakages. Even rarer is the survival of large portions of the original decoration, including gilding and imitation jewels which decorate the chest of the Virgin. There are traces of original red and green painting and substantial gilding across the sculpture. The figure has a sophisticated sway emphasising the relationship of mother and child. The reverse of the sculpture is uncarved, suggesting that the figure was originally positioned against something within a tabernacle or architectural niche. The alabaster figure was purchase by the British Museum from the dealer Sam Fogg with support from the Art Fund, National Heritage Memorial Fund and private donations. The sculpture is now on display in the Sir Paul and Lady Jill Ruddock Gallery of Medieval Europe (G40).